Biker Billy's Irons in the Fire Blog | Welcome to Spring! Welcome to the first day of spring, although it seems like May already here in the mountains of Western North Carolina. For the past several days the weather has been delightfully spring like in the AM and summer like in the afternoon with scattered thunderstorms. Even though today is the first official day of spring I have mowed the grass twice already and all the ladies in the family have gotten light sunburns. Whoa, what will summer be like? I have been starting my workdays on the back porch with the umbrella over the table, iPad and coffee in hand. Truly a wonderful way to work with the mountains in the distance and the spring blooming trees and flowers dotting the landscape. I have been getting the final touches ready for the launch of my updated website; it might even go live tonight. I have also been in the kitchen working on the next book, a Mexican focused project, I love Mexican food and I bet you do too. Today I wanted to cook something warm and green in honor of the change of seasons. I also wanted to surprise my daughter Sarah with a lunch treat. She has embarked on a vegan diet and has been all a buzz with new recipes and food, all very healthy. Reminds me of my embarkation on what has been an over four-decade journey being a vegetarian, rock on Sarah! So I made a “Spring Green Pea Soup” timed to be fresh and ready just in time for lunch on the deck. My wife Mary, Sarah and I have been enjoying eating lunch together on the deck for at least a week now, gotta love this weather. 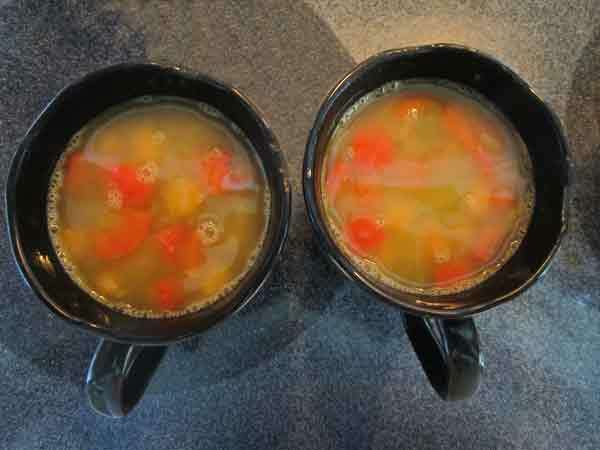 The recipe for the soup is below I hope you enjoy it and can share it with family and/or friends at your own private outdoor café. While soup seems to be a winter warmer, it can also be an invigorating early spring lunch. 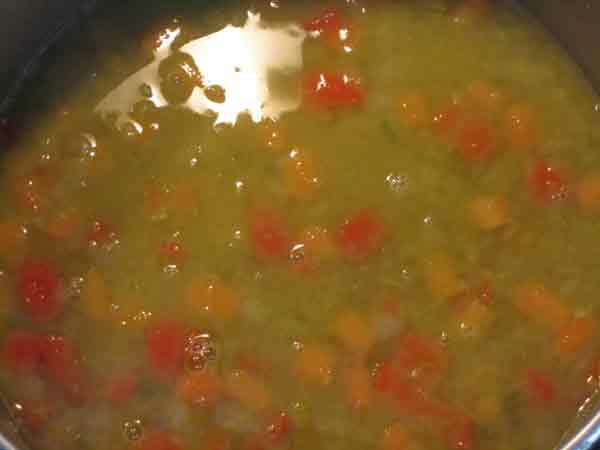 This soup is light and fresh tasting and a delightful green punctuated by the orange carrots and the brilliant red bell pepper; just a nice reflection of life that is all about greening up and blooming flowers. Perfect for those spring days when you return from a ride or are heading into the garden to do some planting. I made this soup to celebrate the first day of spring and bring on the green. I hope it brightens your table and spirits like a sunny day. Place the olive oil in a large soup pot over a medium high heat, add the onions and jalapeño, sauté for 5 to 8 minutes or until the onions are tender. Add the split peas, water, celery salt, white pepper, savory and carrots, stir well and bring to a boil. Reduce the heat to medium and simmer, stirring often for 1 hour. Add the bell pepper and continue to simmer for 30 minutes or until the peas have broken down and the soup is at the desired texture. Serve hot. Makes 10 to 12 cups of soup.